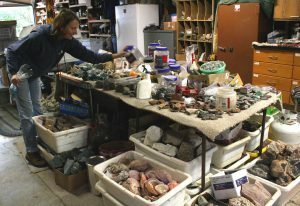 The Santa Cruz Mineral and Gem Society hosts 2 annual Shows a year. Our Spring show is in April and has a large variety of vendors from accross the country. Volunteers welcome as there is a lot of work that goes on when putting on this show. Our second show of the year is in Nov and takes place at the wonderful Live Oak Grange show, this being our smaller of our two shows still packs a pounch with some great local vendors.